FAISALABAD, Mar 20 (APP)::Adviser to Prime Minister on Commerce, Textile, Industry & Production and Investment Abdul Razak Dawood said on Wednesday the government had finalized policy interventions for up-gradation and value addition in textile sector with enhanced market access. 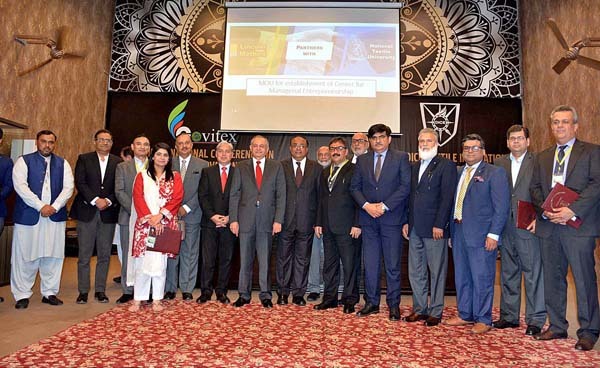 Addressing the 5th international conference on ‘value addition and innovation in textile’ and ‘NTU-DICE Textile Innovation event’ organized by National Textile University (NTU) Faisalabad, he said that now it was time for business community to exploit and contribute its role in capturing the global textile market. to textile garments, the entire chain was working with obsolete technology. from top to bottom so that it could provide sustainable results,” he added. taken in the coming budget. reduce the tariff especially on the import of raw material. with administrative policy and financial supports. signed in April this year, he observed. and bold decisions to revive the national economy. He was optimistic that Pakistan would get maximum foreign direct investment (FDI). “We are concentrating on establishment of 7 special economic zones across the country,” he said. whereas we are offering tax holiday of 10 years, hence, we are expecting maximum FDI in the coming years. for mutual cooperation for strengthening industry-academia linkages. Babar, former Textile Minister Chaudhary Mushtaq Ali Cheema and Mian Muhammad Lateef were also present. Later, NTU souvenir was presented to PM Adviser Abdul Razak Dawood.